McIntosh Poris Associates was recently awarded two 2016 Detroit Home Awards. 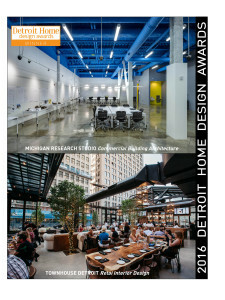 Townhouse Restaurant project in Detroit won First Place for Retail Interior Design and Michigan Research Studio won for Best Commercial Building Architecture. The Detroit Home Awards is presented annually with hundreds of entrants for competition that showcases some of the best design in metro Detroit.